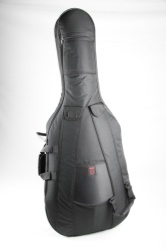 The Kaces Symphony series cello bags feature extra-thick, high-density foam padding, rich velour lining, a rigid reinforced bridge panel, adjustable front handle, two bow pockets, three extra-large accessory compartments, and multiple double-stitched handles for easy carrying. Available in 1/2, 3/4, and 4/4. 1 year limited warranty.